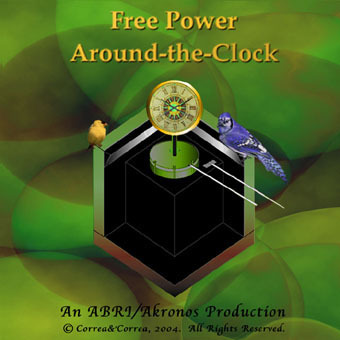 ORDER the DVD "Free Power Around-the-Clock"
A detailed documentary on the work of Dr. Paulo Correa and Alexandra Correa at ABRI (2001-2004) to develop a readily accessible, quiet, free, `round-the-clock alternative power generation system consisting of an Orgone Accumulator modified to optimize its function as a Stirling Motor drive. Stunning evidence for the persistence of the anomalous positive temperature difference atop Orgone Accumulators - first discovered by W. Reich - even when these Accumulators are continually used as thermal Motor-Drives during nighttime. Format: DVD. Digitally mastered. No Region. Running time: 1hour 7 min. "Free Power Around-the-Clock" begins with the Reich-Einstein experiment - when the spontaneous positive temperature difference atop Orgone Accumulators (ORACs) was observed to persist even in naked suspended Faraday cages, and follows on to the Correas' step-by-step development of a hybrid apparatus - the HYBORAC, a cross between a Black ORAC and a Black Faraday cage - designed for daytime exposure to solar radiation and as a drive for Low Delta-T Gamma Stirling Motors. The feature moves on to the development of a variant calorimeter-like HYBORAC for nighttime operation that would be capable of preserving the positive difference while driving the Stirling engine. Early attempts at securing continuous operation reached near round-the-clock results, up to 20 out of 24 hours. Further improvements to the 8 cubic inch HYBORAC enabled its nighttime performance to match that of daytime, with diurnal mean outputs that show this technology to be >1.5x more efficient at capturing solar radiation than passive solar collector standards, nearly 3x more efficient at outputting work-equivalent energy than photovoltaics, and capable of driving a Stirling Motor around the clock, 24 out of 24 hours. Correa, P & Correa, A (2001) "The reproducible thermal anomaly of the Reich-Einstein experiment under limit conditions", Infinite Energy, 7:12. Correa, P & Correa, A (1998, 2001) "The thermal anomaly in ORACs and the Reich-Einstein experiment: implications for blackbody theory", Akronos Publishing, Concord, Canada, monograph AS2-05. * Correa, P & Correa, A (2002) "A modified orgone accumulator (HYBORAC) as a drive for a low delta-T Stirling engine", Infinite Energy, 41:23; also by Akronos Publishing, Concord, Canada, as monograph AS2-25. * Correa, P & Correa, A (2002) "A modified orgone accumulator (complete HYBORAC) as a nighttime drive for a low delta-T Stirling engine, Part II", Infinite Energy, 42:41; also by Akronos Publishing, Concord, Canada, as monograph AS2-26. * Correa, P, Correa, A & Mallove, E (2004) "Power performance of Stirling motors driven from modified Orgone Accumulators" (Part III), Infinite Energy, 53:9. * Correa, P & Correa, A (2003) "Around-the-clock free power from improved HYBORACs driving low delta-T Gamma Stirling engines, Part IV", Akronos Publishing, Concord, Canada, as monograph AS2-32.